Toko is amongst one of my favourite Japanese restaurants in Sydney (and although I acknowledge I have a very long list of favourites, this one does not appear on that list unjustified). Situated in the heart of the one of Sydney's oldest suburbs, Surry Hills is now a thriving community of warehouse-converted apartments and restored Victorian architecture, housing some of Sydney's finest chefs and designers. This suburb screams attention. Today I was here with a group of my girls. The restaurant has a very strict "first in best dressed type" seating policy which means they do not take bookings, and requires everyone to arrive prior to seating the table. The policy is highly un-female friendly given most females these days run on a "I like to be fashionably late" policy. I suppose the argument for this increasingly popular seating policy is to allow restaurants to better manage its seating turnarounds (and inevitably profitability) which is too commonly affected by late customers or worst even, no-shows! However despite this frustrating seating policy and having picked a very busy night, the staff at Toko clearly used their best endeavours to seat us swiftly. The first thing you notice here is the buzz - the place is exploding with customers and the wait staff are constantly seen whizzing around. The place is decked out with a lot of wood, a very modern edge to the decor, but a lot of wood. The lighting is dim, very dim. Almost too dim to house such a buzz of an ambience. 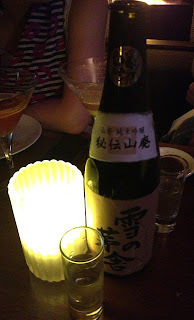 The buzz may also be attributed to their longer-than-the-food-menu drinks menu consisting a wide selection of cocktails, sake, shochu, Japanese whisky and non alcoholic cleansers. We all started with a round of cocktails to sip on while deciding on our orders. To the left of the main dining area is an open sushi bar to allow those lucky enough to score a bar seating to witness the sushi chef in action, and slightly further down is the open robata grill. Be sure to poke your head around and check these out - its quite a show! Toko offers an izakaya style dining, where dishes are designed to be shared (a more detailed explanation of izakaya dining can be found in my earlier post by clicking here). 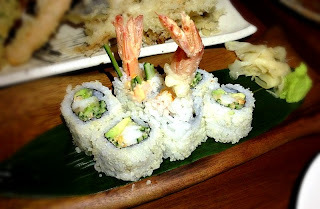 The dishes lean more towards contemporary and modern, rather than traditional and classic, so if you like Japanese with a twist and a bit of fusion you would love this place. 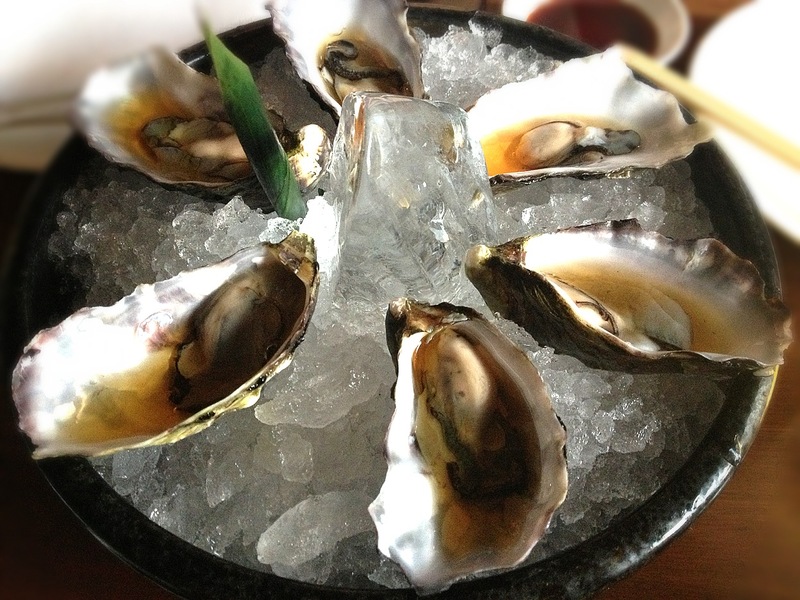 Our first dish, Freshly Shucked Pacific Oysters in Tosazu (a very versatile Japanese vinegar dressing). The oysters were very fresh and chilled well - a great start to the meal. 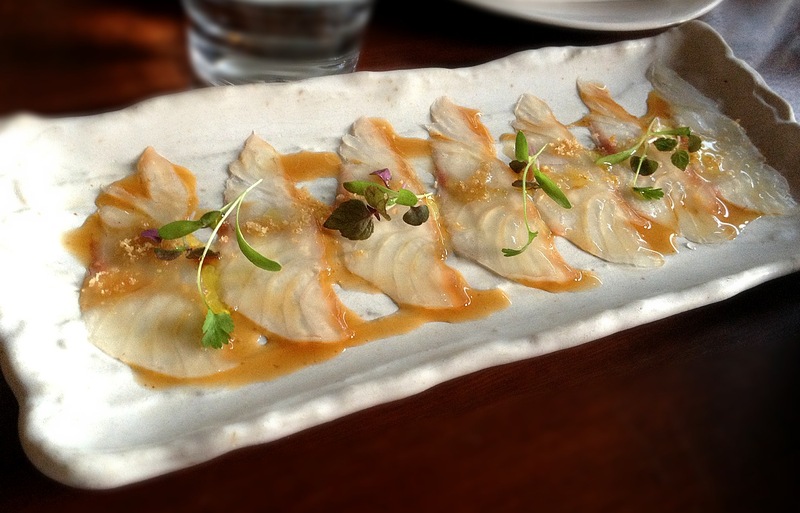 Our next dish was the Thinly Sliced Wild Snapper with Truffle Oil and Pork Crackling. The delicately sliced snapper was dressed nicely in a truffle dressing and micro-herbs, while the crumbs of pork crackling gave the dish a bit of a modern kick. Then came the nigiri to share - we ordered Salmon Nigiri and Mackerel Nigiri. Something traditional we thought. 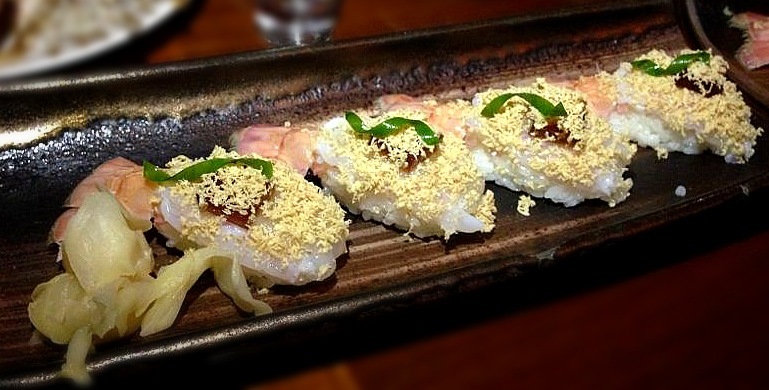 The star dish of the night was the Scampi Nigiri with Fois Gras and Truffle Oil from the Toko Signature Sushi collection. 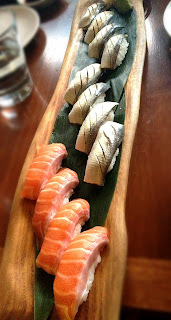 Above and beyond, this is my favourite nigiri, ever. The scampi is fresh and the flavours so well balanced - a foodgasmic experience not to be missed, so good, the table ordered two rounds (and nearly a third)! Also from the Toko Signature Sushi collection, was the Chopped Scallop with Ponzu, Wasabi and Cucumber. 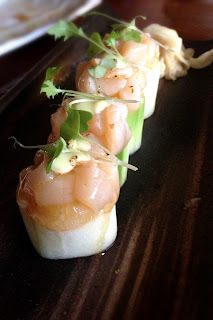 Again a very well balanced dish in terms of texture and flavour, and not to be missed. One simply cannot dine at an izakaya restaurant without ordering a bottle of sake, or maybe two! Our following two selections were from the Toko Makimono menu, the Spicy Tuna and Chilli Mayonnaise Inside Out Roll and the Prawn Tempura, Avocado and Cucumber Inside Out Roll. Next dish was the Moreton Bay Bug Tempura with Chilli Ponzu and Yuzu Koshou Mayonnaise, another Toko favourite. 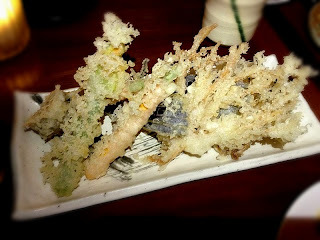 The tempura batter is very light and does not overpower the soft and delicate chunky pieces of bug meat. 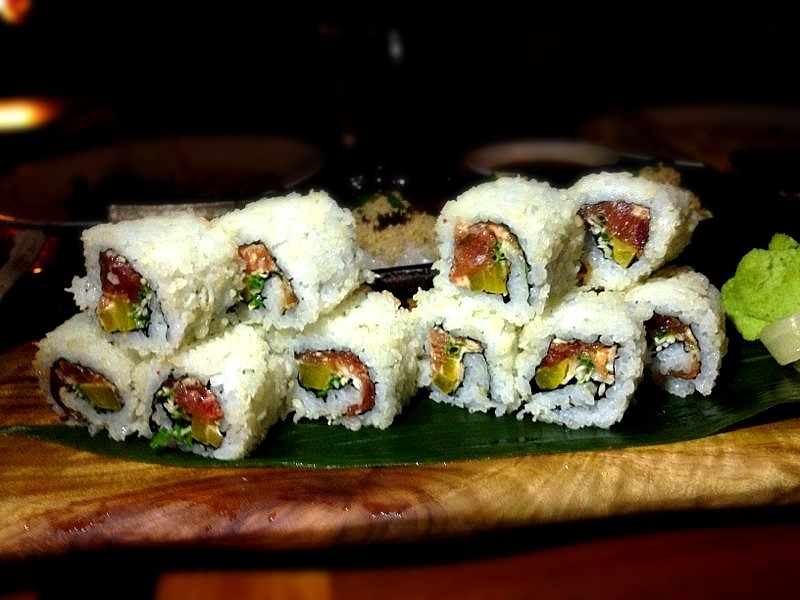 Dip in the ponzu and then the mayonnaise - Yum! 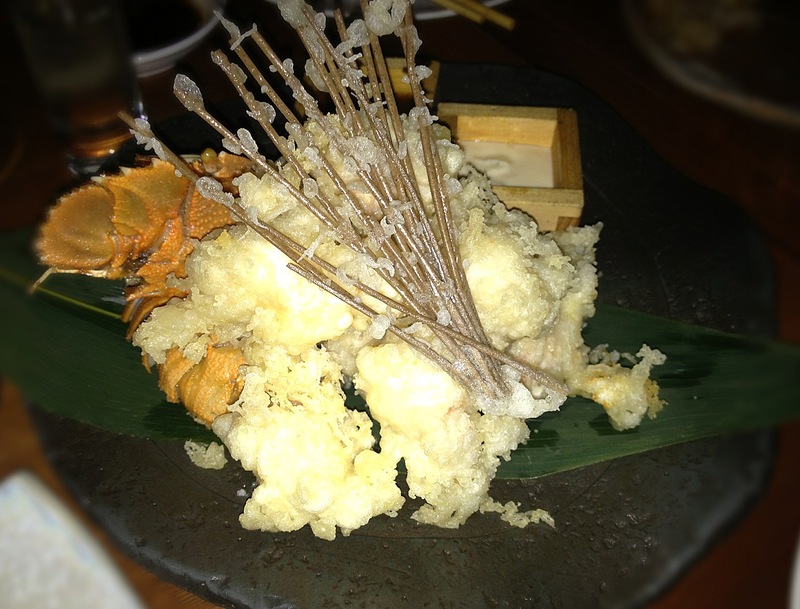 As a side tempura dish, we also ordered the Seasonal Vegetable Tempura. A large serving a various vegetables dipped in the very light batter and fried golden - a simple yet popular dish amongst the girls. 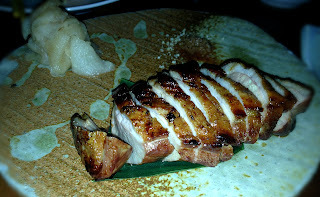 Our final dish was the Duck Breast with Sansho Pepper and Pickled Nashi Pear. Very tender, juicy pieces of duck breast balanced with thinly sliced pear making the meat light and refreshing on the palate. Overall a pleasant meal again and the girls were impressed with most of the dishes. The service was a little bit of a miss with orders taken incorrectly, it was at times a little difficult to get the attention of our wait staff and orders being missed. However a great place to dine with a smaller group, enjoy a very lively and loud buzz, happy chatter. For a tamer environment with more attentive service (and which allows for dinner reservations), try Tokonoma next door. They share the same kitchen and drinks menu as Toko too!